Information about the exchange offers with the UTN is centralized at the area of international relations in the headquarters of the Universidad Tecnológica Nacional, Rectorade. 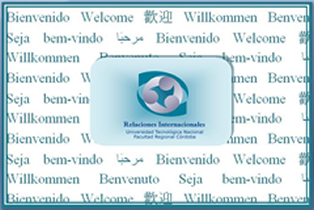 The information is then forwarded to the RRII - Regional Coordinator..
ufficient knowledge of Spanish languagel. Recognition of hazards and acceptance of responsibility..
Only complete applications will be accepted with all the requested documentation, not otherwise taken into account. The documentation of the students must be sent through the exchange program coordinator of the University (partner university). See Checklist. Facultad Regional Córdoba has no accommodation's institution, so foreign exchange students are housed in shared apartments or houses with other students. The Department of International Relations has a list of contacts, and can be made available to students once they complete the requirements for admission. Spanish language requirements are very important because most studies are conducted in Spanish. In the case that students wish to take courses of Spanish, is coordinated with the faculty to develop a supply line with expectations, and levels of requirements. Programs covered by the Facultad Regional Regional are those listed in the Menu Agreements.